MAD watches, based in Edmonton, Canada, makes a helluva first watch. This is their debut kickstarter, and they’re coming out swinging. They sum it up pretty well: “We design high-quality affordable watches while trying to mix modern elements with traditional design standards. We do this by keeping traditional watch design measurements, mix in a few minimalist points, and focus on using only the best materials for our watches.” They aren’t wrong. We’ve had a number of people lay claim to the “minimalism” throne. Usually, it means a large dial, small lugs, and something not far from what Daniel Wellington do. They tend to be quartz, and somewhat boring. Not this. This fits under the minimalism heading, while being interesting in materials, and interesting in movement. Not exactly so with MAD watches. Instead, you get a titanium case with lugs that taper elegantly from the sides of the case. The case is available in Titanium, Rose Gold, or Black. Strap colors are black or blue. 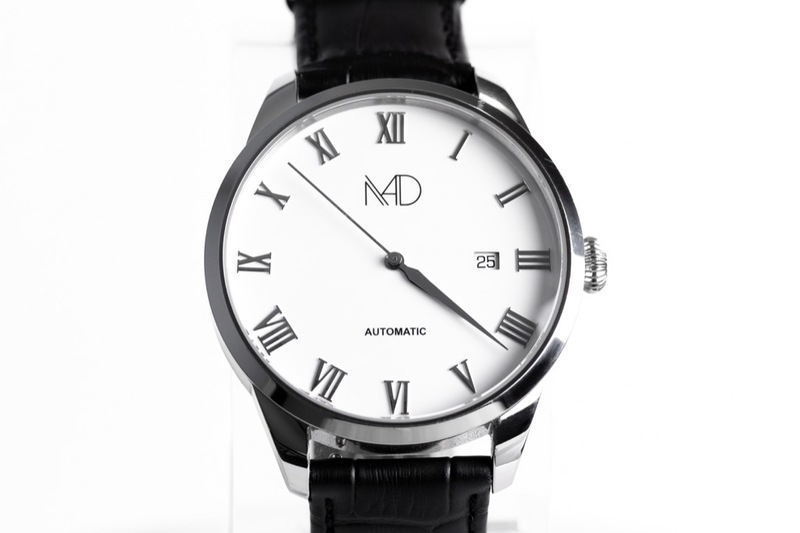 Dials are white or black, with the roman numerals in gold or rose gold depending on which case color you’ve chosen. The movement is an SW-200-1 Sellita, which is an excellent choice for a watch. If this sort of dress watch, that comes with 20mm leather straps, Swiss automatic movement, in titanium is your cup of tea, then you might want to head over to kickstarter.com where prices begin at about $285 USD. They’re a limited edition, said to be capped at 300 pieces. You might be crazy if you miss out. Who we think it might be for: You switch between casual and dress occasions, and want a well-made watch that can live up to either. Would I buy one for myself based on what I’ve seen? : Titanium? Yes. What spoke to me the most about this watch: Titanium and Swiss at a price everyone can approach.